Although Balboa Stadium was the home to some great San Diego Charger teams in the 1960s, few fans know about the stadium the team played at prior to moving to Qualcomm Stadium. 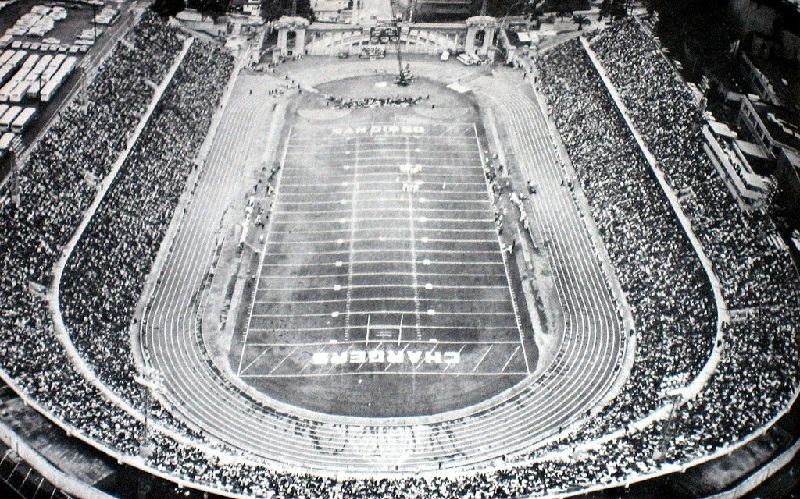 In 1960, the team, then located in Los Angeles, played at the LA Coliseum. For one season the Chargers played in Los Angeles before owner Barron Hilton moved the team to San Diego and Balboa Stadium. Balboa Stadium was constructed in 1914 next to the campus of San Diego High School. Originally it was a simple stadium with concrete seats on both sides of the field. When the Chargers moved to San Diego the stadium was expanded. In May 1961, an upper deck was constructed increasing the capacity from 23,000 to 34,000. This gave the stadium its classic horseshoe look. The Chargers played their first game at Balboa Stadium on August 6, 1961 when they beat the Houston Oilers. For six seasons the Chargers played at the stadium winning the AFL Championship in 1961. In the mid 1960s local sportswriter Jack Murphy began to build support for a new stadium to be constructed in Mission Valley. He was successful and a new 50,000 seat stadium, now known as Qualcomm Stadium, was constructed. The Chargers played their last game at Balboa Stadium in December 1966 and moved into Qualcomm Stadium in 1967. Today Balboa Stadium is used for various high school sports.